Basic Framework - provides the necessary technical background. Traditional Applications - shows how the fomal techniques can be used to analyse traditional ideas. Contemporary Explorations - shows how the algebra gives rise to new forms of analysis. Diagrams - some structural diagrams of the symbols of the Yi. Ideally, you should probably start with the paper describing the basic formal framework before moving on to read the applications papers. This paper describes the formal logical background to much of the rest of my work. Boolean Algebra and the Yijing - this provides the necessary background to understand the mathematical techniques used in analysing the structures of the Yi. It takes a formal look at Cleary's Structural Complement and Primal Correlate relations and also provides the algebraic characterization of changing lines that underpins a lot of my subsequent work. An earlier version of this paper originally appeared in The Oracle, The Journal of Yijing Studies, in Volume 2, Number 7 (Summer 1998), pp19-34. The papers in this section use the formal techniques discussed above to analyse some of the traditional and contemporary structural notions found in the Yijing. Correctness and Correspondence - this is a follow-on paper to "Boolean Algebra and the Yijing". It applies the mathematical tools introduced in the first paper to provide an analysis of the two traditional ideas of correctness and correspondence. This paper originally appeared in The Oracle, The Journal of Yijing Studies, in Volume 2, Number 8 (February 1999), pp25-37. 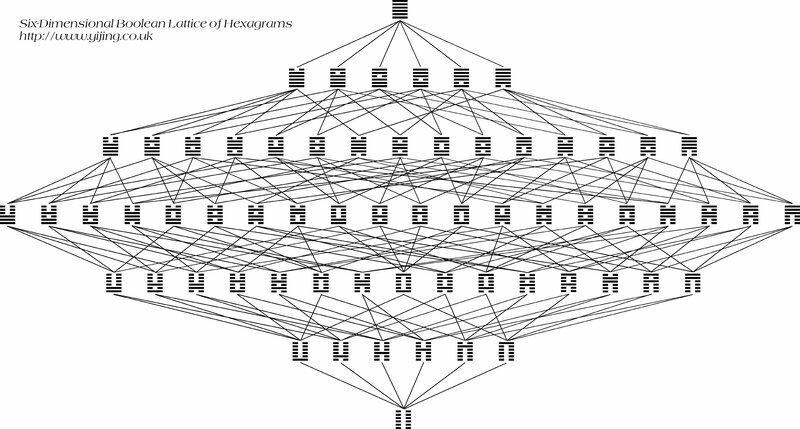 Flowers and Steps in the Boolean Lattice of Hexagrams - this provides a detailed analysis of Karcher's Steps of Change, Secter's Transition Hexagrams and Change Hexagrams, and Hacker's Hexagram Flowers. It shows how all of these techniques can be understood as special cases of the Boolean lattice structure of hexagrams. This, in turn, is taken to provide further evidence of the utility of an algebraic approach to the structure of the symbols of the Yi Jing. This article was first published in the Journal of Chinese Philosophy, Volume 31, Number 4, December 2004, pp489-504. © 2004 Journal of Chinese Philosophy. Readers interested in following this work further should refer to the web note showing a worked example of a cubic subspace which includes some illustrative animations. Tools for Change - this is jointly authored with Stephen Karcher, and applies the mathematical tools introduced in the Boolean Algebra paper to some of Karcher's techniques of interpretation, showing how this can result in a rich set of images for a divination. It includes a formal analysis of the nuclear hexagram construction and Karcher's Steps of Change technique. This paper originally appeared in The Oracle, The Journal of Yijing Studies, in Volume 2, Number 12 (January 2002), pp20-33. Most of the following diagrams are high-resolution images, suitable for full page printing. Note that these diagrams open in a new window. It will probaly help to make sense of the unfoldings in particular if you have read the "Yijing as a Symbolic Langauge for Abstraction" paper above. The Whole Lattice - this diagrams shows the complete six dimensional lattice structure generated by the Boolean algebra. Explicate Matter Cubic Unfolding - this diagram shows how the lattice can be unfolded into a chain of three dimensional subspaces, based on the alternations of the lower trigram. Heart and Mind Planar Unfolding - this diagram shows how the lattice can be unfolded into a chain of two dimensional subspaces, based on the alternations of the middle bigram. If you want a set of images for displaying all the different individual gua, you may download and use the set that I created for this web site. They are zipped into a single file here.